White Gold vs. Platinum: Which One Is Stronger? White gold is sometimes harder than platinum, so why is it that platinum is nicknamed the “eternity metal?” As it turns out, platinum is more durable than white gold, and is able to withstand daily wear and tear without showing as many nicks and scratches. Platinum holds even the most complex and intricate settings for precious stones for longer periods, and signs of wear polish out very easily. When it comes to the molecular density of platinum vs. white gold, it turns out that pure platinum is about 60% more dense than pure gold. It doesn’t “wear thin” like gold can, meaning it retains its form and size for decades. While yellow gold has historically been the metal of choice for wedding jewelry, platinum or white gold has replaced it in popularity, both because of its practicality and its beauty. Platinum vs. White Gold: Which Is Hypoallergenic? Because white gold is an alloy, it can cause skin irritation in some people. Meanwhile, even the most sensitive ring fingers say “thank you” to platinum’s purity. This metal is completely hypoallergenic and is safe for daily wear. Platinum or White Gold: What About Luster? Both platinum and white gold are beautifully shiny. Platinum’s natural luster needs no real maintenance except for polishing. White gold needs to be dipped in rhodium in order to stay lustrous and retain its pale hue. This process is so inexpensive that many jewelers do it at little or no cost. Another difference between white gold and platinum is that platinum has the ability to develop an antique patina that makes the diamonds it contains look even more sparkly, making vintage platinum jewelry highly desirable. If you are considering the value of platinum vs. white gold engagement rings in terms of heirloom desirability, platinum is the better choice. Given the differences in desirability, platinum vs. white gold prices are at opposite ends of the scale. Platinum is a connoisseur’s choice and can be very expensive. White gold is beautiful, but as it is less valuable, it comes at a lower cost. 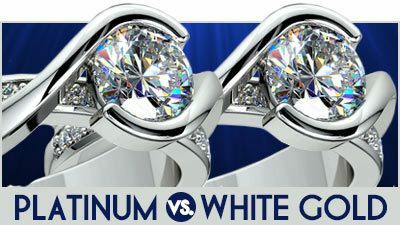 When making the decision between platinum or white gold, there’s more to consider than platinum vs. white gold prices. Platinum vs. white gold engagement rings have a nearly identical look on the hand, and as long as white gold is properly maintained, it retains its beauty. If cost is the most important factor, invest in the diamonds rather than the metal for the time being and consider having a platinum setting added at a later time if that is what you really want. Whether you go with platinum or white gold, it pays to be well-informed about the pros and cons of each. 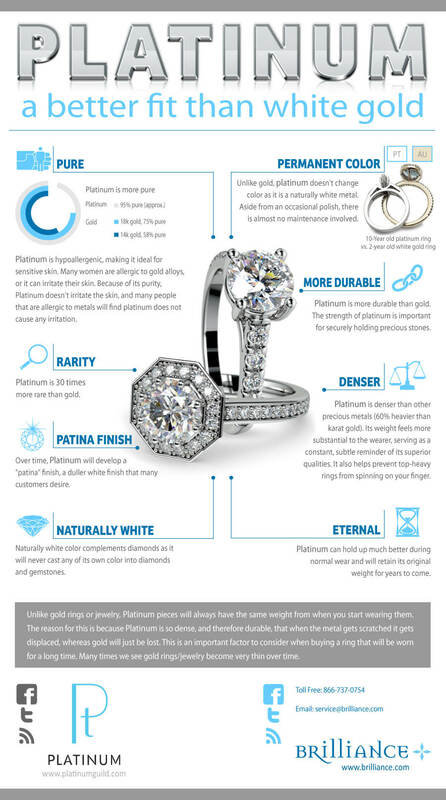 For more information on the benefits of platinum check out our platinum versus white gold infograph.